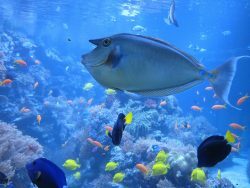 Whether you have one fish or an aquarium full of fish, feeding them all can be considered a chore by some. For others, going on vacations, out of town on business, or just during the day while you are at work can become an issue since you still need to feed your fish. Automatic fish feeders will be able to help on both accounts. If you just want to feed them automatically once a day or multiple times every day, an automatic fish feeder can be a blessing in disguise. They are simple to setup and easy to maintain. What is the Automatic Fish Feeder? Automatic fish feeders come in different forms, sizes, and with interesting and helpful features. There are both wall powered units and battery-operated units, and some which have both. They often have moisture management features that are designed to keep fish food from rotting. Many of the models have splash proof functionality so that it does not make a mess and splash water when it drops the food in. 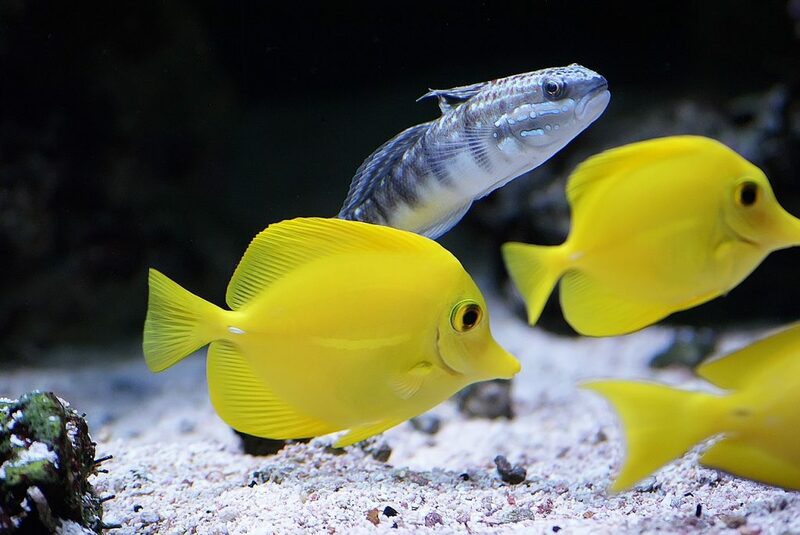 An automatic feeder will work with most tanks and aquariums, however if the opening is located at an unusual location or angle it could pose a problem. Some aquariums may even include a bracket or space made specifically for you to add on an automatic feeder. If you tend to forget that you need to feed your fish or need to use while you are out of the house, an automatic feeder is a mush add. Having peace of mind that even if you forget to feed them you will not risk have any of them getting ill, or worse die, is enough reason to make the investment. The investment cost is not high anyway as the prices for a tank feeder or aquarium feeder start under $25. Compared to the cost of setting up your aquarium and obtaining all of your beautiful fish, it’s small a cost to you. 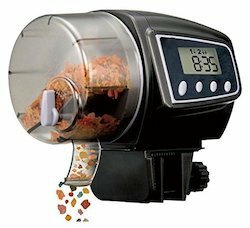 A key feature of an automatic aquarium feeder is the ability to program it with specific time based feeding cycles that expel specified amounts of any type of fish food you choose. Some tank feeders and aquarium feeders even have a separate compartment to dispense nutrients, vitamins, and even medication if needed. It will also help to keep your aquarium nice and clean since it will only feed as much food as needed, based on your settings. If you are looking for food to fill the feeder you choose, you are in luck. 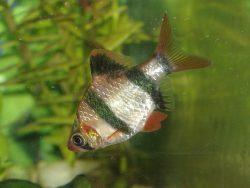 We have guides for freshwater fish food guide, saltwater fish food guide, betta food guide, and if you are specifically looking for pond, koi, or goldfish food, we have a guide for that too. Coming in first is the Eheim Battery Operated Auto Fish Feeder. Eheim brand products are extremely reliable, are easy to maintain and will last you a long time. This is truly one of the best automatic feeders on the market and you won’t be disappointed. It is completely programmable via its digital LCD can have up to 8 feeding settings a day. Included is an internal fan with ventilation, ensuring that the food stays dry. 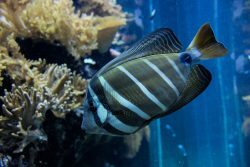 It can be mounted on almost all tropical tanks, freshwater tanks, or saltwater tanks. This feeder comes with Velcro and a mount so that there is no way possible it could fall off or into the aquarium. Setup is easy and it can be reprogrammed as often as you need. Included is a manual release button for those times that you need to feed your fish outside of their regular schedule. It works with any food type you use for regardless if you have freshwater fish or saltwater fish. Using an adjustable slider, you can decide the portion size based on the amount of fish and size of your aquarium. 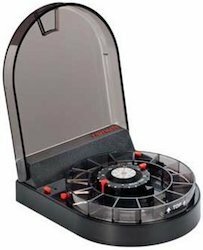 The IntelliFeed Fish Feeder is another great product for you to choose from. It keeps the fish food dry via its completely enclosed container that slides out and then turns 360 degrees to drop the food. This system is intricate but is helpful in keeping the food dry, which is very important as wet food will clog up the container and feeding hole and spoil quickly. This feeder is very well made and will last long enough that its higher price tag will be warranted. One thing to keep in mind with this feeder is that if you user larger food you might need to break it up. It is slightly more difficulty attaching this feeder to some types of the aquariums. It also does not sit as securely so be wary of bumping it accidentally. If you install it correctly you should have not have many issues and it’s still a great product. This Eheim Twin Automatic Feeder is great for use with tropical fish aquariums, freshwater fish aquariums, or saltwater fish aquariums that have a large variety of fish or larger fish. This feeder has two separate containers that can hold different food types and can be programmed individually. That feature is great for feeding at different times of the day or if you have fish that feed at different levels; top feeders, middle feeders, and bottom feeders. It includes a random feeder option to help simulate more natural feedings. A digital display is used for programming and runs off 4 AA batteries. The two compartments are aerated to keep your food dry. The one issue with this feeder is it’s designed for larger aquariums, so it might not fit smaller aquariums. 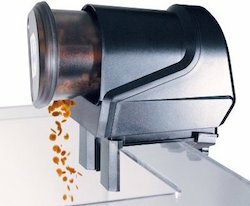 The Rusee Daily Automatic Feeder is designed to be able to feed up to 6 times a day. It’s very easy to install onto the side or lid of your fish aquarium. Programming is easy as well, simply turn the green dial onto the feeding time you want. It also has an adjustable feeder setting that allows you to choose how much food you want to dispense each time. This feeder can attach to the aquarium a variety of different ways due to the flexible design of the mounting unit. It’s one of the cheaper options and should be reliable enough to trust it while you are away from your home. As always, make sure to test it before you have to leave. This is a great feeder for all your little friends including betta fish. The only real issue is the mounting clip can be a little tricky at first. Klaren Fish feeder comes in two models, one that can feed 4 times per day and one that can feed 8. Whether you choose the 4 or the 8 model, you won’t be disappointed. It has an adjustable feeder so that it can dispense as little or as much as is needed for the fish in your aquarium. The display is an LCD and is fully programmable. It’s designed to help prevent moisture from getting inside the food drum. The large food drum can hold a lot of food which is great for extended time away from home. It is simple to install onto the side of any tank just by adjusting and tightening the screw knob. The one issue with this unit is if you do somehow get water in the drum, you will need to manually clean it as it does not have an aeration system like some other options. The setup instructions are also not good, but once you figure it out it’s easy to replicate and change. The Fish Mate F14 Aquarium Fish Feeder is an interesting option as it has 14 individual meal compartments. 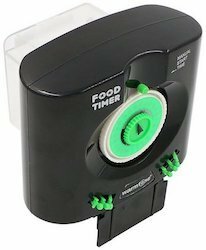 This gives you precise control of how much food to dispense at each feeding. It can feed up to 4 times a day and can take all the different kinds of food available. 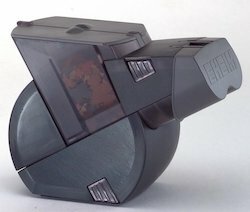 It’s a bit larger of a unit due to the design. It can sit either on top of the hood and dispense through the feeding hole, or it can be mounted onto the side of the tank. One of the issues is keeping the food dry, if you tend to have a lot of moisture or any splashing. However, it does and an attachment that can be connected to a pump, granted you will need to own or buy the pump separate which is the issue. Another thing that is worth to mentioning is to not put anything on top of the feeder as it can interfere with the turning of the drum. 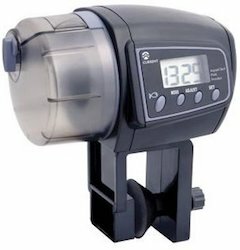 Coming in last on our list is the Current USA Aquachef Automatic Fish Feeder. It comes with a reliable and easy to use mounting clamp that will fit on most smaller tanks. Then, remove the rubber suction cup from the inside of the clamp. It can feed your fish up to 4 times a day and is a reliable option. It is programmable and displays everything on an easy to read LCD screen. Each time the drum dispenses food it turns 360 degrees which helps to break up any clumps of food. One of the major issues is that it is best for smaller tanks that have thinner glass or acrylic sides as the clamp only opens up to 7/8 inches wide. Make sure to measure the width of your glass or acrylic before you choose to purchase. We hope that this list, while rather extensive, gives you the knowledge and details to make an informed decision on which automatic fish feeder to go with. Regardless of which brand or option you pick, you should be satisfied. We do recommend testing out and making sure it’s correctly programmed before you do leave the house for an extended period of time. It will also work great for feeding during the day while at work. Your little friends will be happy and healthy by getting regularly scheduled feedings. Thanks for reading and please leave us comments letting us know which feeder you use and what you think about it, and if we missed anything you think needs to be mentioned in this guide.